Daily Illuminator: Triplanetary Shoots For The Stars On Kickstarter! January 10, 2018: Triplanetary Shoots For The Stars On Kickstarter! The wait is over – Triplanetary is now on Kickstarter! It's been more than 25 years since we announced the return of your favorite game of interplanetary warfare, so we are delighted to finally make this a reality. This classic game of space combat was designed by Marc "Traveller" Miller and originally released in 1973. A second edition was released in 1981, but it's been out of print since then. Now, you can get this game through Kickstarter, with a larger map and 5/8" counters! For those who like more detailed space warfare, this version includes an alternative combat system . . . but the original rules play just as well as they did in 1973, so we kept them as the default. 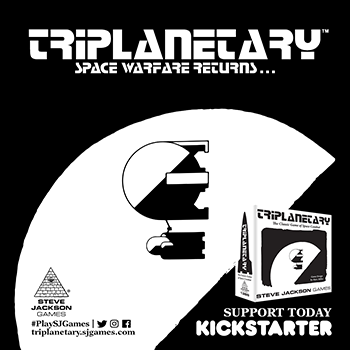 Triplanetary backers can support at the Triplanetarian level to get one copy for $45 (with free shipping), or they can be a Humanitarian and back for $80 to receive two copies (again, free shipping). Give one to a friend! And yes, we also have a support option for brick-and-mortar retailers. We expect to get Triplanetary to its backers by August 2018, and will hold preview sessions at Origins 2018. This Kickstarter campaign will close on February 9; time flies, so take a look at the Kickstarter and back this classic game's revival!